SAP Business One can send emails directly from the client application. Email is the preferred way of doing business in today's business world so your customers expect it. The ease of sending an email through the client will encourage your employees to use it often. Setting up this powerful functionality is extremely easy, so let's get started! First we need to get on the SAP Business One server to set up our email configuration. Connect via remote desktop into your server or go down and sit in front of the keyboard. Find the program called "Service Manager" on your start menu. It will start up on your taskbar near the time & date as a little blue and red icon. Double click the icon to bring up the service manager. The service manager is a program that has a handy GUI interface for managing important services that need to be running for SAP Business One. There are some optional services and some are not optional. The one we are looking for is called "SBO Mailer". This is the service that holds the email configuration we are interested in. Select "SBO Mailer" from the second dropdown. Here we need to make sure of a few things about the service. Make sure "Start when operating system starts" is checked. This forces the service to start whenever you reboot your server. Once we are done configuring the email setup, we need to click the green "play" icon to start the email services. If you start it now you will have to restart it later. Each of the four buttons below the service status we will have to setup. The schedule is how often SAP Business One emails are sent from the server in batch processing. Settings is where you will fill in the details about your email server, in this example we will be setting up Gmail. The connection button allows us to connect with SAP Business One. Lastly, database is where we setup which database we will be allowing emails from, most likely this will be just your production server. Let's get started configuring! Click on the "Schedule" button in the service manager window. This will bring up the schedule that SAP Business One will send emails off in a batch. When an email is submitted inside the SAP client, the SBO Mailer service will collect them and send them in one big batch. You need to decide how often you want this to happen. If you anticipate a heavy email volume you may want to set this lower as large batches can slow down the server. For light usage I would recommend every five seconds and selecting "By Intervals". Click OK.
Next click on the "Settings" button back at the service manager window. This is where we will type our email configuration. The only requirement is that your email server must support SMTP. Gmail will work for this because SAP Business One supports TLS. Take a look at the screenshot for an example of Gmail setup. Type in your SMTP server name, the email account that you will be using to send out emails from SAP Business One, and the SMTP port of your server. 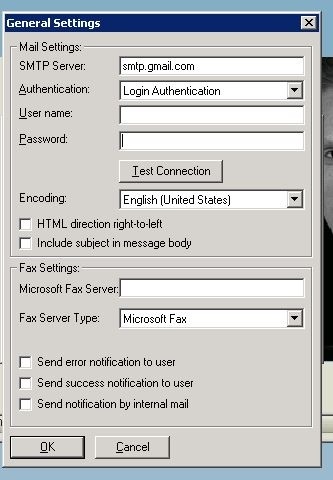 The rest of the settings on this page is for email report delivery and setting up the fax functionality which we will be covering in other kb posts. Click OK to continue setting up our email. Now we're going to click the "Connection" button on the service manager window. This part is the interface from the SBO Mailer service to SAP Business One. In the first box, type your license server's DNS name or IP address. It will automatically fill the "B1SiteUser" in the second box. Then type in the password for the "B1SiteUser". If you don't remember the password - you need to follow this "Resetting the Site User" procedure. This password is set when you first installed SAP Business One so try to remember what you may have set. Click OK and if you end up back at the service manager window, your password is good. Click the "Database" button in the service manager window. You will see a list of SAP Business One databases that your server is hosting. Check the box next to your production database and click OK. You can select other databases as well, but make sure you want to do this. Sending out emails from a development or testing databases probably would confuse your customers. Now to start the "SBO Mailer" service, click the green "play" icon on the service manager window. If your service is already started, click the red "stop" icon, wait for the green icon to reappear and click it. Test your configuration by loading up a fresh Business One client and clicking the email icon on the main icon bar. After setting up your test email and clicking send, you should have received the friendly green status message in your client that the operation completed successfully. Congratulations! If you receive a red bar message you may have to troubleshoot your configuration a bit more. Go over the steps in this article to see if you missed something. You may also have to reboot your server. That's all there is to setting up email in SAP Business One, if you need any further assistance, please drop us an email or comment on this kb article! How do you set it to send through a different gmail address based on which B1 User sends the email? I don’t want all emails from SAP coming from the same address. That seems silly. In the SBO Mailer we define a Username which will send Mails but I want to define multiple users over there. SO, how it can be possible..? Hi, Im using SAP Business One 2007, how can I set up the setting step? How do I set up the mailer and start sending the email?